1. Login to your myLSU account. 2. On the left hand side menu, locate the Financial Services tab on the left side of your screen. 3. In the pulldown menu, click Reporting Tool. 4. 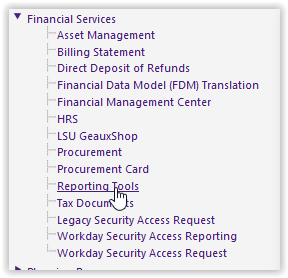 A new page will pop up showing the Reporting Tools window.